Muffins are awesome. Blueberry muffins are even more awesome. Therefore banana blueberry muffins must be like some type of alien crack. 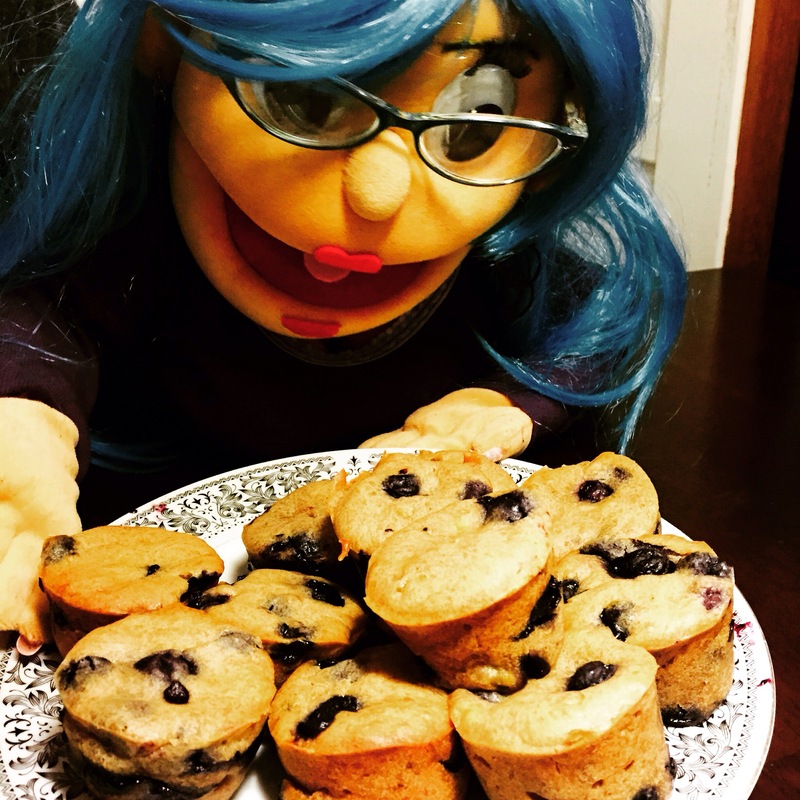 And I guess that a lot of people love having warm gooey breakfast muffins, but I don’t know… Maybe it’s a puppet thing, but I am a firm believer in the midnight snack muffin. Here’s my current favorite banana blueberry muffin recipe, let me know what you think! You may want to hold the blueberries to just one cup, I just love having super fruity gooey muffins so I personally prefer 2 cups. Ingredients: 1 1/4 cup gluten free flour mix 1/2 cup almond meal 1/3 cup brown sugar 1/3 cup cane sugar or coconut sugar 1/4 cup coconut oil or earth balance 1 cup of almond or coconut milk 1 cup fresh or frozen blueberries (or 2 for super gooey ones!) 2 very ripe bananas 2 tablespoons agave or maple syrup 1 tablespoon apple cider vinegar 1 teaspoon baking soda 1 teaspoon baking powder 1 teaspoon salt 1 1/2 tablespoons vanilla extract 1 1/2 teaspoon cinnamon Cooking Instructions: Step 1: Preheat your oven to 350 degrees and line a muffin pan with paper muffin cups or grease the pan lightly with earth balance or coconut oil. Step 2: Mash the bananas in a medium sized mixing bowl. You leave some chunks if you like gooier muffins! Step 3: Add all of the wet ingredients in with the bananas (the agave, almond or coconut milk, vanilla extract, and apple cider vinegar). Step 4: Melt the coconut oil or earth balance in a small pan and then add to the wet mixture. Step 5: Mix all of the dry ingredients into a separate bowl (the sugars, gf flour, almond meal, salt, cinnamon, baking soda, and baking powder). Step 6: Add the wet mix to dry mix and stir until you have a nice paste. Step 7: Put the blueberries in a separate bowl and mix them with a spoonful of gluten free flour until they are evenly coated. Then add them to the other mixture. Step 8: Use a spoon to put the muffin paste in the muffin pan. Fill each muffin tin cup about 3/4 of the way full. Step 9: Bake your blueberry banana muffins for 22-28 minutes. If you use frozen blueberries they will probably be ready closer to 25-28 minutes. Step 10: What are you doing??? It’s way too hard to wait almost 30 minutes for muffins you crazy person! Quick, lick all of your cooking utensils and scrape your mixing bowl until there’s nothing left and anyone who wanders into the kitchen wonders how you managed to have such clean dishes without even washing them! Step 11: Ok if you’ve managed now to lick everything clean and still have time to spare, please don’t just stand around staring at the oven and leaving puddles of drool on the floor. People will think you’re very strange. No really, it’s weird. Stop please. Step 12: Eat the finished muffins! Eat them all right now! Wait!! Stop!! Let the cool first you idiot! Geeze you really are totally nuts! Enjoy! !